Electronic circuits can be fiddly to make: engineers have to snap components onto a board or etch designs onto a copper surface. 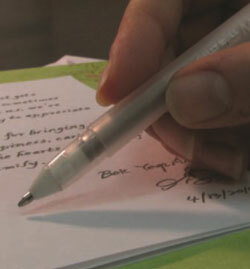 Now a US group of researchers has demonstrated that all you really need is a pen and some paper. The new method, which uses a rollerball pen to be filled with conductive ink, could enable engineers to create one-off circuits that are cheap, flexible and disposable. 'Pen-based printing allows one to construct electronic devices "on-the-fly",' says group leader Jennifer Lewis, at the University of Illinois at Urbana-Champaign. There has been a lot of interest in so-called desktop electronics manufacturing in recent years. Researchers have demonstrated that, using conductive ink, it is possible to create circuits using airbrushes or even inkjet printers. As a result, devices such as LED displays, antennae and even batteries have been printed onto various surfaces, from fabric to paper. The pen-on-paper technique might be the most straightforward and accessible method yet. Lewis's group made a conductive ink from silver nanoparticles, produced in solution by reducing silver nitrate and using a capping agent (poly-acrylic acid) to prevent the particles growing too big. The researchers then removed the capping agent and tailored the viscosity of the ink by adding hydroxyethyl cellulose, before loading it into a store bought rollerball pen. Using this pen, Lewis's group was able to draw working circuits for an LED display and an antenna, which they folded into a spherical shape. At times, the components had to be attached using an extra blob of ink and superglue, but at other times the only tools necessary were the pen and paper, says Lewis. Once dry, the researchers found that they could bend the paper circuits several thousand times before any breaks appeared. In fact, Lewis's group has shown that it can write the conductive ink on other surfaces besides paper, such as polymer films, wood and ceramics. The next step for the researchers is to expand their ink palette to include other conductive substances. 'This is an important step towards enabling desktop manufacturing using very low cost, ubiquitous printing tools,' says Lewis.